I haven't been as excited about a nail collection as I have the collection you are about to see. Not least because the shades are beautiful, bright and fun, but the ladies in the MBBE group including yours truly had a hand (and plenty of nails) in helping to select these shades to feature in the collection. 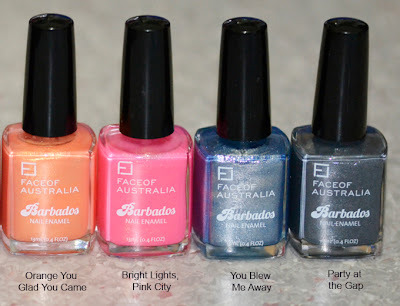 Barbadoes are a set of micronised glitter packed nail colours that just makes your names shimmer and shine in all types of light so your digits are always the centre of attention. 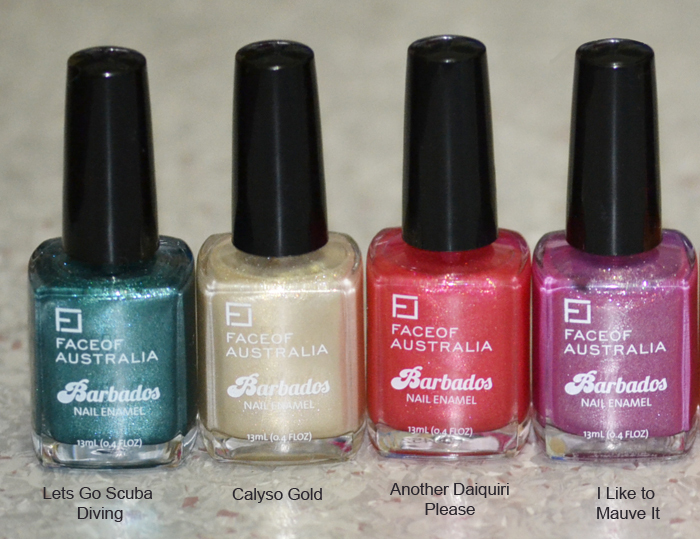 Inspired by the island party atmosphere in tropical Barbados, the shades are playful and fun and come with clever names (some of which are chosen by our beautiful Jacie). Without further ado, let me introduce the shades to you. 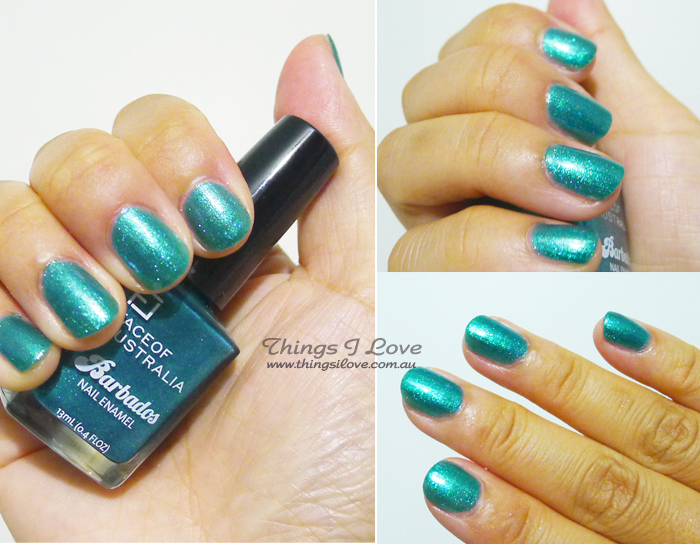 A bright shimmery teal green shade that reminds me of mermaids in the sea. A stunning pinky-mauve shade with silver microshimmty that is both warm & cool and looks great on any fingers. This is another firm favourite. 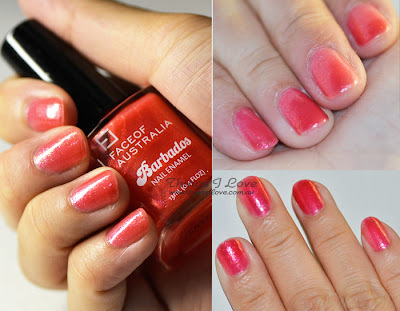 A deep neon orange shade with glittering gold shimmer. It will grab all the attention when paired with the black or dark coloured clothing. 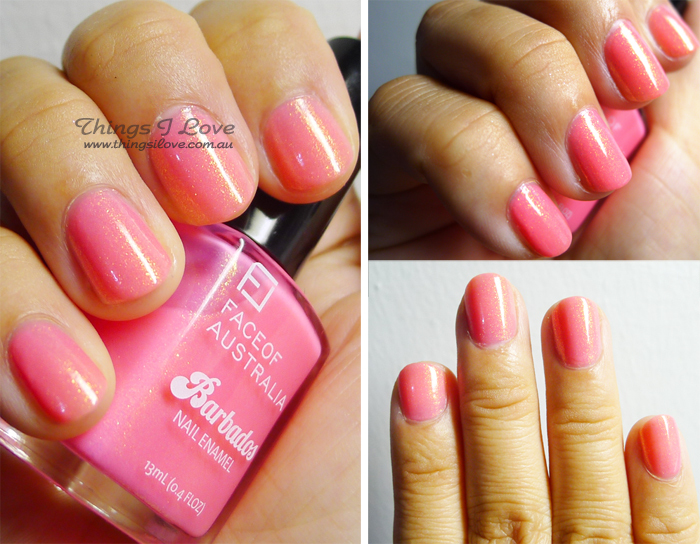 Barbie will be proud with this cool toned bright jelly pink with golden micro-shimmer shade. Also on my highly recommended list. A Sky blue with silver shimmer that just brightens up my day any day of the week. 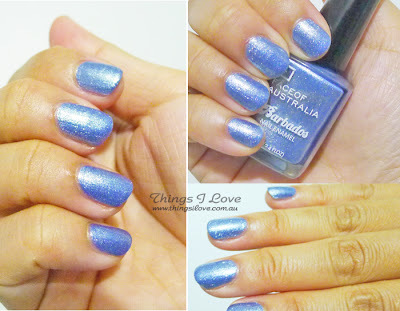 If you love blue then you need this shade. A steely grey with silver and blue micro-shimmer. 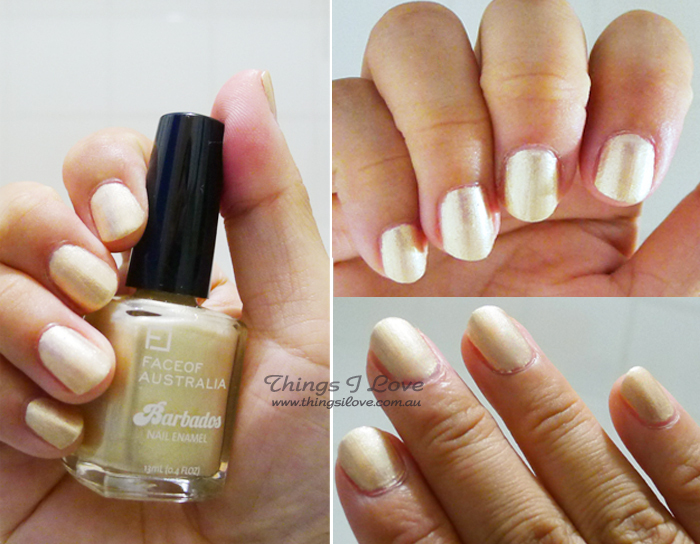 This is the perfect statement nail shade for the cooler autumn weather. Really, it's a must-have shade. I'm mighty impressed with the pearlised finish and the long wear of the polish. 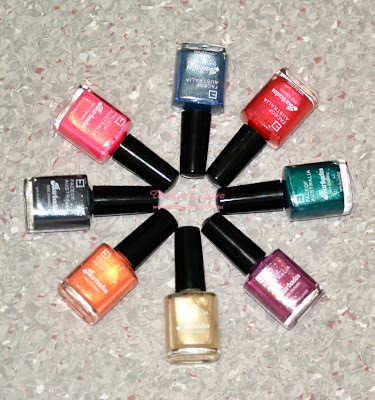 The high shine fine shimmer means that the nails polish goes on smoothly and is very easy to apply and I can go 2 days without tip fade (3 coats). With a top coat, I can almost get a whole week of wear before it needs to be taken off . 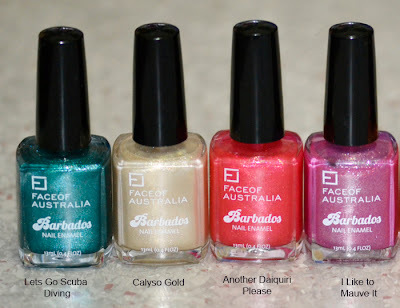 The only shade I had some trouble with application was Calyso Gold as it's the lightest shade, 3 coats were needed to get a even streakfree finish (all the other shades except Another Daiquiri Please & Bright Lights, Pink City are 2 coats in the swatches). RRP A$4.95 at selected Priceline, Kmart, Big-W and selected pharmacies now (I'm told that these will be in store late next week, so mark your calendars). This is a limited edition and I would definitely not want to miss the versatile shades in the collection if I were you (and that's before my biasness for this collection starts to insist that you go and get all the shades!). This featured collection was provided for consideration.